Oh, this book. 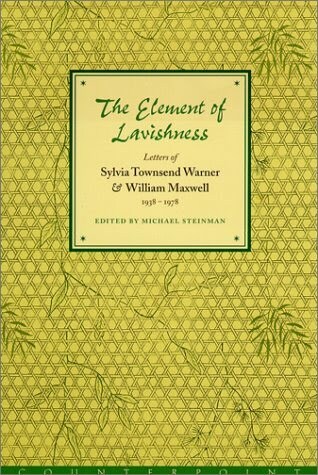 When I saw Simon’s review of The Element of Lavishness: Letters of Sylvia Townsend Warner and William Maxwell, 1938-1978 edited by Michael Steinman I was intrigued. I had never read anything by either Warner or Maxwell but I find it difficult to refuse any book of correspondence between well-educated, interesting people. When I picked this up though, I had no idea just how deeply I would fall in love with it, with Warner, with Maxwell, and with their warm, affectionate relationship. But in the 1950s their letters deepen in understanding and sympathy, giving way to the lavishness of the title. They become deeply entangled in one another’s work and domestic lives, with no detail too small, no thought too fleeting to be written down for the benefit of the other. Seeing it evolve from a work relationship to a friendship to a deep love between not only them but also their families (encompassing Warner’s partner Valentine and Maxwell’s wife Emmy, and, later, Maxwell’s daughters Kate and Brookie) is incredibly moving. I came to love them both and to love, more than anything, their love for one another. Pour Niou [their Siamese cat] has just had his first affair of the heart, and of course it was a tragedy. As a rule he flies from strange men, cursing under his breath, and keeping very low to the ground. Yesterday an electrician came; a grave mackintoshed man, but to Niou all that was romantic and lovely. He gazed at him, he rubbed against him, he lay in an ecstasy on the tool-bag. The electrician felt much the same, and gave him little washers to play with. He said he would have to come again today to finish off properly. Niou who understands everything awaited him in a dreamy transport and practising his best and most amorous squint. The electrician came, Niou was waiting for him, and he rushed into the garden and disappeared. As a record of aging and loss, Warner’s letters in those final years are magnificent. Frustrated, tired, and resigned, she has lost some of her wonderful energy and confidence but retained her intelligence and humour. I love her best as an old woman, free of pride, betrayed by her body, longing to see William and Emmy one last time. Both authors make frequent mention of books: what they’re reading, writing or reviewing. Usually when I come across pages-worth of book mentions, I keep a detailed list, getting almost as much joy out of that as out of the book itself. This reading experience was remarkable because I didn’t note down any titles; I was so focused on this book that I couldn’t spare a thought for any other. It consumed me and surely this is the greatest proof of that. The book is very intimate and I felt quite awed at being allowed to read such personal letters and witness the evolution of such a tender, honest relationship as existed between Warner and Maxwell (who I am desperately fighting the urge to call Sylvia and William as I write this, having grown so used to their first names). I came to love and feel for them both and felt bereft when the letters finished in 1978 with Warner’s death. Strangely, I don’t feel any particular need to read any of their short stories or novels. I loved both of their writing styles but my interest is in them as people, not as authors. Their personalities filtered through fiction would seem a sad, pathetic replacement for their real selves as revealed in these letters. I honestly have no idea how any other book I read this year will manage to surpass the experience I had reading this. It is exquisite and so, so precious. Claire! How your review warms my heart. How lovely that you not only responded almost exactly as I did, but you’re able to express it so well – so I can just write ‘and so say I!’ at the bottom. A combination of their incredible talent as writers, openness as friends, and (especially Sylvia’s) capability for perceptive observation make these letters the most precious collection I have encountered. I never thought I’d love a volume of letters more than the Mitford Sisters’ one, but Warner and Maxwell came along and proved me wrong. Thank you again for such a beautiful review. I’m so pleased you enjoyed the review, Simon, and thank you so much for having introduced me to the book! Oh wow…I need to get this book! Not fair when you and Simon gang up and both gush about a book that is not to be found in the library! 😉 Wow. You really made this sound irresistible. I appreciate what you said about not needing to read the author’s works, but being content to enjoy them as people. The first book I read this year was Maxwell’s, So Long, See You Tomorrow, and I didn’t care for it at all. That made me think I wouldn’t care for this one enough to hunt it down. However, you have now convinced me that I would indeed enjoy this one very much. Ah….another for the list! Wonderful review. I held my breath when I checked my library’s catalogue for this after reading Simon’s review, never expecting to find it. I’m sorry your library wasn’t able to surprise you as mine did! Whatever it takes, this book is worth tracking down. I don’t know either of these authors, but I’m now firmly convinced I need to read this! You really need to, Lisa! I think you will enjoy just as much as I have. Thanks, Lucy! I hope you’re able to track down a copy and start reading soon. I remember you mentioning Sylvia & David before, probably when I brought this back from the library, and I put it straight on my wishlist! Do move this to the top of your pile – it’s too wonderful to neglect any longer! I just recently read Two Gardeners, another book of letters between two literary figures. One of them was Katherine S. White, Wagner’s predecessor at The New Yorker. I’m intrigued by your review of The Element of Lavishness, Claire. Your enthusiasm oozes throughout. I’d love to get my hands on this. I was reading this when you reviewed Two Gardeners, Penny, and was so excited to see White’s pop up just when she was being mentioned in my book! Oh Claire! Am I right in remembering this was part of your library loot recently? What a charming book to savour, I was hooked from the bit about deciding whether to wash your hands or keep reading while in the tub. Something a booklover anguishes over but never talks about! My husband is off to London next month and he has asked for a list of titles to look for. I’m writing this one down. You are right, Darlene. I picked it up in December and held off reading it until January just so that I wouldn’t upset my ‘Best of 2011’ choices. I’m very glad I did so since this will almost certainly be on my ‘Best of 2012’ list! And how lovely to have a personal shopper to send abroad! I hope he finds this for you. Claire, What a treasure, to know that someone else has only recently read this book and maybe, as I have, a few others of Maxwell’s, and been so besotted, as I have. I knew I couldn’t it bring it up among my friends because I couldn’t bear the frown that would come over their face! Thank you for the review – a gift. Deborah, I’m very happy you found and enjoyed the review! The internet is truly wonderful for bringing like-minded readers together to share their bookish joys. This sounds incredible and I definitely want to get my hands on a copy. It is wonderful! Best of luck getting your hands on it! Lovely review! Much looking forward to reading this one as soon as possible. Am currently in the middle of Warner’s correspondence with Valentine during their 39 years together. It is indeed eye-opening to see the intensity of their passion and affections they have for each other, through their explicitly expressive letters. Reading your extracts on Warner’s grief after Valentine’s death makes it all the more heartbreaking. Warner really pours herself into her letters, so I can well imagine how intense her letters to Valentine must be. I’m really looking forward to reading more of her letters and diaries now that I’ve discovered how much I enjoy her! Ohh – sounds wonderful. Unfortunately, the library copy is out and not due until July! (University library – very long withdrawal periods.) I’ve put it on my list and will intermittently check and see if it’s been returned early. I started reading this book a few years ago after a friend recommended it, and at some point I put it down, only because I never wanted to be finished reading it. At this point I’ll have to start anew but it will be such a pleasure! Thanks for reminding me about its loveliness. This sounds beautiful and I’m so excited to read it. Thank you for linking back to it in your top books of the year post – somehow I missed this when looking back through your archives. Any book that sticks out this much to a book blogger is worth checking out!